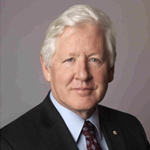 Bob Rae was elected 11 times to the Ontario Legislature or the House of Commons. He served as Ontario’s Premier from 1990 to 1995 and as interim leader of the Liberal Party of Canada from 2011 to 2013. In 2011, his colleagues named him Parliamentarian of the Year. Bob returned to legal practice in 2013 and is currently a senior partner at OKT – Olthuis Kleer Townshend LLP where his practice focuses on First Nations, Aboriginal and governance issues both in Canada and internationally. Bob acts as advisor to the Matawa Chiefs Tribal Council respecting the potential development of the Ring of Fire area in northwestern Ontario and as senior advisor to the Aboriginal Institutes Consortium. A distinguished senior fellow at the University of Toronto’s School of Public Policy and Governance, Bob is also a distinguished professor of Victoria College and a senior fellow of Massey College. He is a past president and the founding chairman of the Forum of Federations and also a past chairman of the Institute of Research on Public Policy. His community service has included chairing the boards of the Toronto Symphony Orchestra and the Royal Conservatory of Music as well as serving as chancellor of Wilfrid Laurier University. The author of five books along with major reports on higher education and the Air India bombing, Bob is a member of the Order of Ontario and a companion of the Order of the Canada.